One of Canada’s most mercurial artists, Joel Gibb is the lead singer, songwriter and choir captain of The Hidden Cameras. Forming in Toronto in 2001, Gibb and his gang of musical provocateurs have created music and live performances legendary for their raucous, unfettered celebration of freedom and sexuality. Released on the eve of Canada’s sesquicentennial celebrations, ‘Home On Native Land’ is an inquisitive ode to Gibb’s homeland; it’s a stealthy return to Canadian soil both philosophically and physically. 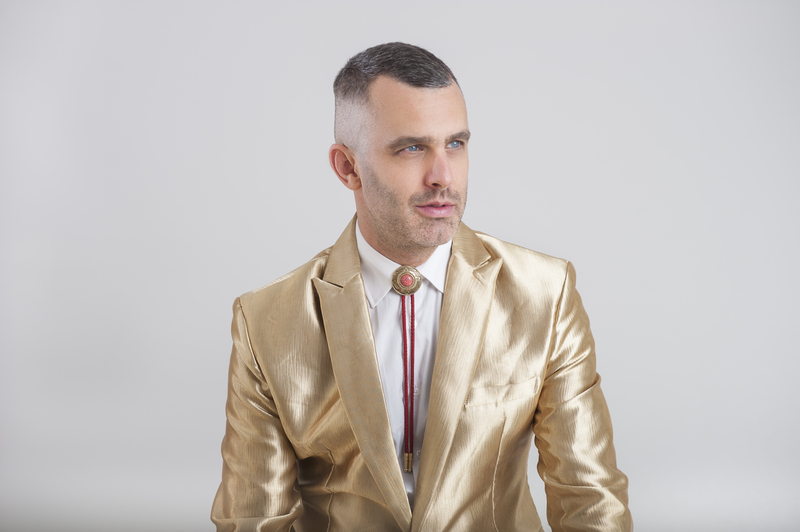 After relocating to Berlin for some time, The Hidden Cameras pick up and head west to commune with musical ancestors and explore the gentle folk sounds of the Canadian countryside. But as with everything Gibb does, there’s a darker undercurrent flowing beneath the Canadiana terrain. With the title ‘Home On NativeLand’ being a play on the national anthem line ‘home and native land’, this title questions the definition and identity of Gibb’s nation, referencing the raging debate about repatriation of First Nations in Canada. Ever the master of subversion, Gibb arches an inquiring eyebrow at the personal as well as the political through his songs, returning to themes of belonging and identity from within. As a commanding, provocative figurehead of the LGBTQ community, Gibb inhabits the guise of the lonesome cowboy to his own ends, plumbing the depths of musical memory and delivering a beautiful album of life ­affirming experiences in all its colours along the way. ‘Home On Native Land’ was written and recorded over ten years by Gibb with friends, bandmates and icons including Rufus Wainwright, Feist, Neil Tennant, Bahamas, Ron Sexsmith and Mary Margaret O’Hara. Gibb once again assembles a band of musical accomplices and takes them on an adventure in revisionist history, forming a chorus of voices over a score of dulcet tones and twanging rock. The album makes new offers to the Canadiana genre with infectious melodies (“Big Blue”) and wild hymns (“Drunk Dancer’s Waltz”),overarched by Gibbs’ trademark, honeyed vocals and sighing guitars. His talents as a songwriter and composer remain undimmed, his on point lyrics oozing with hopefulness, joy and sorrow. Alongside several new compositions, ‘Home On Native Land’ also borrows from the classic country songbook, reimagining soulful standards like “Dark End of the Street,” and “Don’t Make Promises” originally recorded by Tim Hardin. “Log Driver’s Waltz” is a cover of one of the most successful and beloved Canadian folk songs of all time. On “He is the Boss of Me” Gibb turns the tables and covers himself, giving a classicHidden Cameras song a proper studio recording, transforming it from an early 4­track demo from 2001debut EP ‘Ecce Homo’.